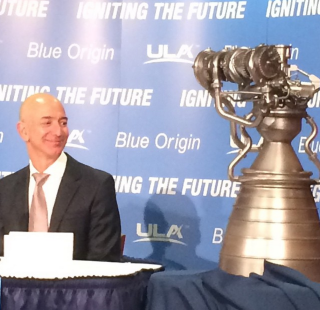 Jeff Bezos looks on as a new model of Blue Origin's BE-4 liquid rocket engine is revealed during a press event on Sept. 17, 2014. Blue Origin, the secretive private spaceflight company led by billionaire Jeff Bezos, has teamed up with a veteran space launch provider to build a new rocket engine designed to reduce U.S. dependence on Russian hardware. In an announcement today (Sept. 17), Bezos and the launch provider United Launch Alliance unveiled plans to develop Blue Origin's new BE-4 liquid rocket engine. The new partnership will allow ULA's next-generation rockets to come equipped with engines that are built in America. At the moment, ULA uses Russian-made RD-180 engines to power its Atlas 5 rockets. A model of Blue Origin's BE-4 rocket engine on display on Sept. 17, 2014. The United Launch Alliance is currently launches most U.S. government and military satellites using its Atlas 5 rockets, as well as Delta 4 booster variants. The company is a cooperative venture by Boeing and Lockheed Martin. Blue Origin's partnership with ULA states that full-scale BE-4 engine testing should begin in 2016, with the first flight due for launch in 2019, according to representatives. Although ULA and Blue Origin did not release the cost of development for the BE-4 engine, it will be privately funded. Blue Origin and ULA have committed to funding it 100 percent for the next five years. Blue Origin began testing its BE-3 rocket engine in 2013. "This agreement ensures ULA will remain the most cost-efficient, innovative and reliable company launching the nation's most important national security, civil, human and commercial missions," Tory Bruno, president and CEO of ULA, said in today's statement. "Blue Origin has demonstrated its ability to develop high-performance rocket engines and we are excited to bring together the best minds in engineering, supply chain management and commercial business practices to create an all-new affordable, reliable, American rocket engine that will create endless possibilities for the future of space launch." Tensions between the United States and Russia have been heightened due to Russia's involvement with the conflict in the Ukraine. Because of that political situation, ULA has come under fire for its use of the Russian rocket engines. Today's Blue Origin-ULA rocket engine news is the second time in two days that a commercial spaceflight vernture including Boeing has made headlines. On Tuesday (Sept. 16), NASA announced that Boeing's manned CST-100 spacecraft, which is slated to launch on Atlas 5 rockets, was one of two vehicles picked to fly American astronauts as part of the agency's Commercial Crew Transportation Capability program. Blue Origin's BE-4 engine won't serve as a direct replacement for RD-180s that power Atlas 5 rockets. Instead, Blue Origin's new engine will outfit ULA's next generation of rockets, according to Blue origin representatives. NASA also picked the Dragon spacecraft developed by California-based SpaceX, led by billionaire Elon Musk, as its second commercial space taxi for astronauts. The announcement Tuesday came after a four-year competition of aerospace companies that included Blue Origin's Space Vehicle and the Dream Chaser space plane developed by Sierra Nevada among the spacecraft contenders.